The First Two Months: Essentials for Life with a Newborn. 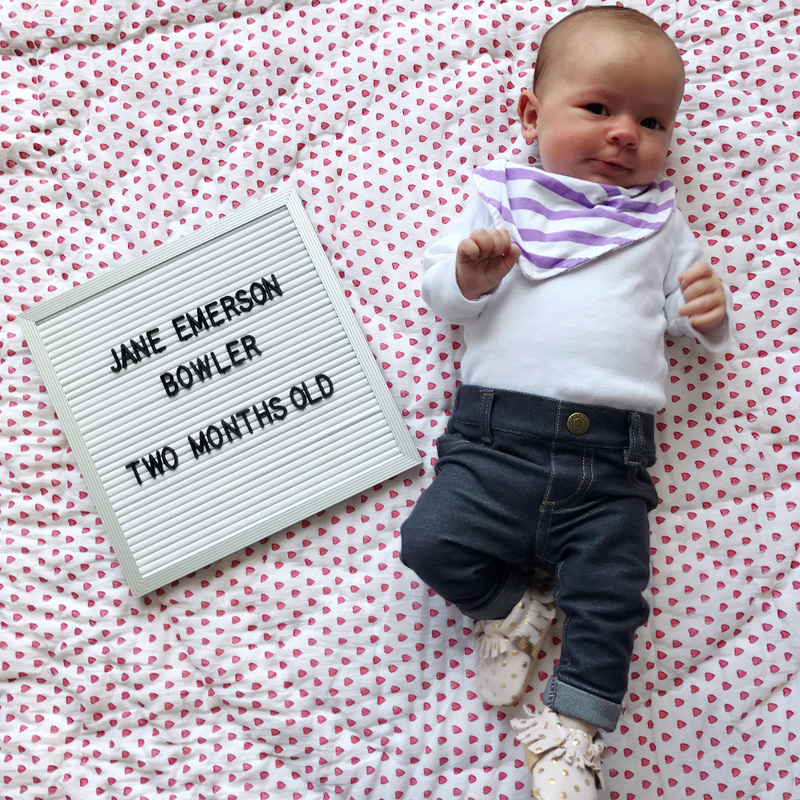 Miss Jane is two months old today! I can’t believe it. I had a grand plan to write this post after her first month and share all of the essential items that got us through those initial weeks. But the first few weeks are a blur, and now two months later I finally got my act together to share all of the things that were super helpful for my recovery and for our survival as first-time parents! I read so many of these types of posts when I was pregnant and I loved hearing different experiences about what worked for others; I hope my own experiences can be helpful for others too! Essentials for Mom: During the first few days home from hospital my number one essential was all of the help my husband and mom gave me. I have a tendency to push myself a little too hard and they both kept me in check to make sure I didn’t overdo it while I was recovering from the C-section. But since I don’t think I can lend out Mike and Mom to everyone reading this post, there were a few other key items I relied on during those first few days at home I thought I’d share! First, I drank so much water when I got home. One of my nurses told me lemon water worked wonders for reducing swelling that happens from the epidural, and another told me that drinking tons of water was key for breastfeeding, so I was constantly hydrating and toting around my Swell water bottle (I love how it keeps water so cold!). I have been living on my homemade granola bar recipe too – it’s amazing how much hungrier I’ve been post-pregnancy. They’re key for quick snacks to grab when you have just a few moments between baby squeals to eat something. Another key was staying comfortable – which can be pretty difficult post surgery – and I lived in some of maternity leggings, some oversized loose t-shirts, and a really comfortable sleeping nursing bra. I had a great experience with a sales associate at my local maternity store that assured me I needed these early on, and I was skeptical because I never wear a wireless bra, but they’re amazing. I’m still sleeping in them after two months, and have some very comfortable regular nursing bras I rely on during the day now too. The same sales associate convinced me to grab a cozy nursing wrap too, and it’s been my go-to item to grab and wear during late-night and early morning feeding sessions. During those first few days at home I was still learning how to hold Jane comfortably, and navigate carrying her up and down our stairs. I have an awesome pair of rubber-soled slippers (that barely look like slippers, bonus!) from Birdies Slippers that gave me a little extra security in my footing carrying my squirmy newborn in my arms. After those first few weeks I’ve packed up the maternity clothes and yoga pants and am back in my pre-baby jeans (yay! ), but still need to be conscious of my apparel being nursing-friendly. Nursing tops have to be the ugliest things in the world and I refused to spend money on them – I’ve instead been wearing Boden’s swing t-shirts that have a little extra room around the waist area, but still look fitted and stylish. They’re so soft too! That’s all I really relied on outside of my normal routine for the past two months for me. Jane on the other hand required a bit more! Essentials for Baby: I should start this section with a caveat that Mike and I both agreed early on in my pregnancy that we wanted to be baby-gear minimalists. I get into a total funk when our house is cluttered and things are out of place, and he’s the same way. We’ve made a very conscious effort to only use the essentials, and say no to a lot of specialty items (wipe and bottle warmers? Nope!) to save on space and money. During the first few days at home, sleep was the main priority for all of us. I hear from so many moms that the Rock n’ Play is the baby item they can’t live without, and it was really helpful for us during the first few days. I actually couldn’t get in and out of our bed because it was too high to climb into with my incision scar still so fresh, and similarly, I couldn’t bend over into a crib to lift Jane in and out without experiencing a ton of pain. So I slept on the couch and Jane slept next to me in the Rock n’ Play for maybe a week until I could finally move around more comfortably. Swaddles were another key to sleeping success — it really works wonders to calm down a newborn baby. We kept Jane in a variety of swaddles, I liked the Aden and Anais brand because they were nice and big, June and January makes a nice cozy cotton version that seemed to stay very secure for our expert swaddle escapee! There are so many different kinds of these sleeping swaddles and after a trying a few of them, we learned that Jane hated having her hands and arms restricted, in fact she always sleeps best with her arms wide out to her sides. We landed on the Halo Sleep Sacks working best for keeping her warm and cozy at night. We also switched away from sleeping in the Rock N’ Play about a week after we got home from the hospital and have her sleeping in our room in the bassinet topper of our 4Moms Breeze. I love this thing, Jane sleeps really well in it and it’s been a literal “breeze” to disassemble and travel with. Outside of sleeping, there’s lots of feeding and diapering! For feeding, I’m constantly using the Boppy Pillow. I know there’s tons of debate on which nursing pillow is the best, but I really this one because it’s aesthetically pleasing (get cute covers on etsy!) and doubles as a support spot for Jane to hang out now that she’s a little bigger. For diapering, I’ve already become pretty brand loyal to Target’s store-brand diapers and the Honest wipes (cute packaing helps, but I what I really like is that they’re big, unscented, and clean well!). One item that I thought was a little frivolous pre-baby was waterproof changing pad liners. 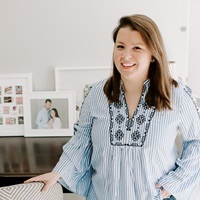 Post-baby, I realize now that they’re a godsend and are so much easier to quickly replace and wash than the whole changing cover every time they get a little messy – which is often. For changing on the go I have a few essentials that I keep in a diaper clutch, and I move it from bag to bag because Mom still has to look cute! Newborn Pajamas – There is nothing worse than changing a diaper at 3am and having to fumble with 15 tiny snaps! I love the pajamas from Gap, and some of the options from Carters, that have a zipper closure to speed things up! Every second counts when you’re getting a few hours of sleep at a time. Kimono Onesie – during the daytime we always grabbed the June and January side-snap onesies because they’re so much easier to get on a squirmy little baby. I have no problem 2 months later popping Jane’s head and arms through a shirt, but the kimono style closure is really helpful when they still feel so delicate. Car Seat. Jane loves her car seat; she’s actually sleeping in it right now while I write this. Sometimes she’ll fall asleep in it before we’ve even gotten outside to the car. I’m really happy with how light this one is and how easily it snaps in and out of the bases. We bought two bases, one for each car, and it’s been so much easier than swapping them out each time we change vehicles. A few other car seat accessories we’ve loved too: a car seat mirror to keep an eye on her while driving, and this black and white stroller toy – she stares at it non-stop! Baby Bjorn Bouncer – Remember when I said I wanted to be a baby minimalist? I think this bouncer seat is a prime example of that mentality. It’s got a really clean design, and will grow with Jane into a toddler chair when she gets older. I pop her in this when I’m taking a shower or making dinner. She’s been enjoying since she was probably 3-4 weeks old and it’s incredibly helpful when you need free hands. Nightlights. We realized on the very first night at home that our bedrooms are super dark, and turning the lights on for midnight feedings is a quick way to wake up everyone. Mike ran out the next day and bought nightlights for all of our bedrooms and it’s made such a huge difference keeping Jane in “sleep mode” when we have to shuffle to her room to change her in the middle of the night. OxiClean. The amount of laundry that we do with a baby is mind-boggling. I should have had Mike write this bullet point because he’s really our laundry champion. He has a whole system set up in our laundry room and swears by OxiClean for pre-soaking clothes that haven’t survived the diaper-change. Cradle. This is another discovery by my savvy husband. It’s a white noise app and it’s magic how it soothes Jane when she’s having a meltdown. We both have it on our phones, and will sometimes use it to help her get to sleep, or stay asleep if we’re in restaurant or busy place. Moccasins. Okay adorable baby shoes aren’t actually an essential – but they make me SO happy when Jane wears them. Baby socks also never stay on her feet, so I make sure she’s wearing the moccasins to keep her feet warm, they stay on way better! I will not lie, those first few weeks are certainly amazing and filled with so much joy and love, but gosh they’re pretty rough too. At the time, it feels like you’re never going to have a “normal” again. Even with tons of help, the sleeplessness combined with the process of recovery and taking care of a tiny helpless human being, it can feel like you’ll never experience “normal” life again But after a few weeks you establish a routine, everyone falls into a rhythm, and before you know it you have a new normal. Part of me can’t believe it’s been two months since Jane was born, because now it does feel so much like part of our everyday life, like she’s always been here. It feels like pregnancy and the labor and bringing her home from the hospital happened ages ago. And then at the same time I think about how incredibly short two months of time is, and how crazy it is that our world has been flipped upside down and filled with so much excitement and love in such a brief moment. I can’t wait to see what the next months bring! Springtime Pastel Parties. DIY Marbled Photo Stands. 2 Responses to "The First Two Months: Essentials for Life with a Newborn." Yes x1000 to the oxyclean. I started to give it as a shower gift! That’s such a good idea!